PORT MORESBY: Information and Communication Technology policy and programmes across the public sector are currently developed on an ad-hoc basis, without a structured plan to guide such activities. This revelation was made by the Minister for Communications, Information Technology and Energy-Honourable Sam Basil. Mr Basil was speaking today (Friday, 2 March 2018) at the Annual Leaders’ Summit in Port Moresby’s Crown Plaza Hotel. But, he said he was passionate about getting down to the bottom of this and have the house in order. Basil further said in line with the aspirations of Medium Term Development Strategy and others, to develop an overarching ICT policy roadmap is a way forward. He cited that its consultation process had already started in July 2017 with its final draft report expected in April, 2018. He added that he was keen on establishing both the ICT and ENERGY TASK FORCES to set the pace in accelerating implementation of National Rural Electrification and rural telecommunication project across the country. “To accelerate implementation in both rural electrification and telecommunication, all key government agencies at all levels-together with the private sector, non-government organizations and civil society- should work together. “Uncoordinated ICT development has been costly to successive governments due to duplications and subsequent wastages. Non-uniform implementation has resulted in our government having difficulty to achieve an efficient and cost-effective integrated Government system,” he told the participants at the summit. He stated that to coordinate and mobilize resources for all government stakeholders in existing systems and service integration, and new ICT projects, guided by a soon-to-be-drafted ICT policy, can accelerate implementation through team work. 3. Under the Department of Communication and Technology, Integrated Government Information System is in progress to provide for a single platform to connect all of government information system to enable a safe, resilient, secure, cost effective and unified system. Mr Basil also gave an update on his Bulolo district’s success story on rural telecommunications and electrification. Hon. 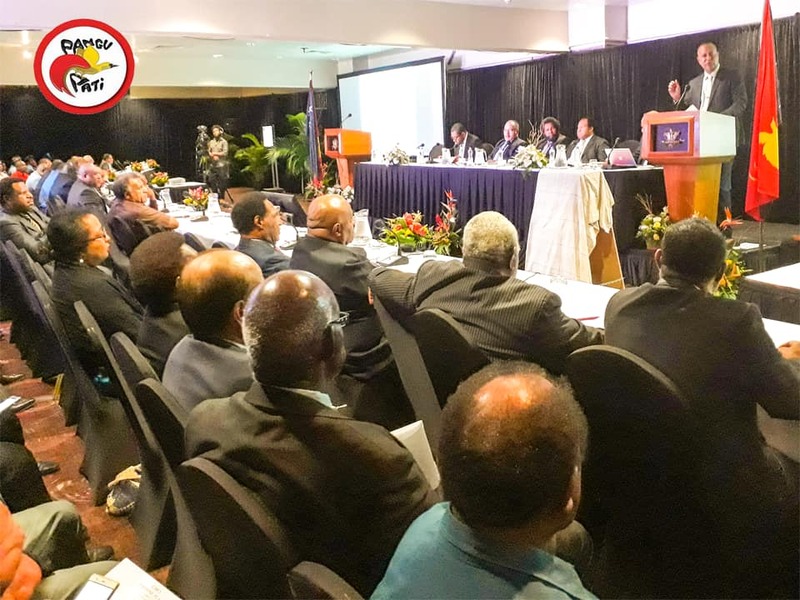 Sam Basil is speaking to participants at the annual leaders' summit in Port Moresby's crown plaza hotel today (Friday, March 02, 2018).